King Baldwin II, the King of Jerusalem, installed the Order in a part of the Palace of Jerusalem believed to be Solomon's Temple, from which they took the name of Knights of the Temple or Templars. The order's battle honors in the defense of the Holy Land are now legendary, while the accounts of their missing accumulated wealth are still a mystery. 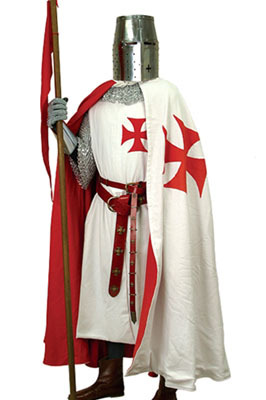 Shown here with our Templar Cape (sold separately), this heavy cotton sleeveless tunic has been dyed a bright white. The Order's Maltese styled red cross has been appliqued over the heart, while a full linen lining has been sewn on the interior. Dry clean only. Choose S/M or L/XL.